The physical influence of the executed criminal could live on long beyond execution, post-mortem spectacle and burial. 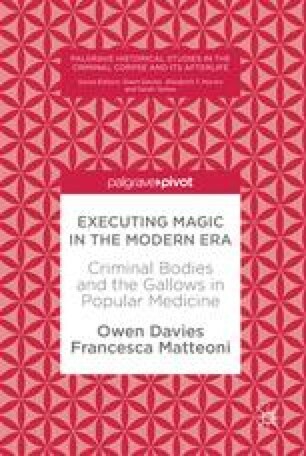 This chapter explores how different cultures viewed and dealt with the spirits of executed criminals, and carried out a range of preventative post-mortem practices to ensure the dead did not come back to terrorise the living, whether in the guise of vampires or ghosts. It then considers why spiritualists in the nineteenth century actively sought out communication with the criminal dead. The curious American tradition and influence of Hangman Friday is also considered. The physical influence of the executed criminal could live on long beyond execution, post-mortem spectacle and burial. The resort to the relics of Christian martyrs for help and healing is an obvious example. The Catholic Church has long promoted the practice of touching or praying before the bones and associated objects of the saints . Many were attributed to biblical figures or the early church fathers. In south-eastern Italy, for instance, especially in the regions of Abruzzo and Puglia, epilepsy was known as the sickness of St. Donato , a beheaded martyr who was invoked for healing and protection. 1 However, some popular relics belonged to more recent centuries, such as Catholic priests executed for their faith in Protestant territories. The most well-known example from England is Edmund Arrowsmith , a Jesuit executed in 1628. His hand was cut off and preserved, and into the nineteenth century Catholics and Protestants alike sought out its stroke as a miraculous cure-all. But the focus in this chapter, in keeping with the rest of the book, is with executed common criminals. We have seen how pieces of the criminal corpse and the hanging rope acted as talismans and charms, while sometimes, as with Mary Bateman, body parts retained their identity decades after, rather like saints’ relics. Yet it was the spiritual, and not the corporal, remains that most often constituted the long-term, continued relationship between the executed and the living, an afterlife in which, freed from the criminal corpse, the criminal spirit could trouble and terrorise, but also atone through negotiation with the living. But let us start with a societal haunting of a most unusual kind: the malign shadow that hangings cast over the working week in America. In nineteenth-century America , there was a widespread belief that Friday was an unlucky time to start a new piece of work or to embark on any ventures, because executions regularly took place on that day. In sympathetic association with the fate of the criminal on the gallows, any work begun would never be finished. Friday is obviously widely associated with the crucifixion of Christ, and the notion of it being unlucky was quite widespread. In England, there were folk beliefs (unrelated to executions) about it being ill-starred to be born on a Friday or to turn a mattress on that day, for example. There was a strong belief amongst fisherman that it was an unlucky day to set out for a catch. 2 However, the notion of Hangman’s Friday is distinctly American, due to numerous states making Friday the customary time of the week for executions. In colonial eighteenth-century America, the English Murder Act of 1752 dictated that all convicted murderers had to be hanged within 48 h of sentencing, though Sundays had to be avoided. In the early Republic, Thomas Jefferson proposed, likewise, that the condemned be executed on the second day following conviction. 3 So how the Friday tradition became so engrained in American capital punishment custom is intriguing. However, despite Ohio and Pennsylvania taking a state-wide stance, elsewhere the practice persisted, because it was ultimately left to the predilections of judges and governors to decide hanging days. The issue arose periodically when judges shied from tradition. When the murderer, Menken, was executed on a Wednesday in Elmira, New York, in 1899, it was suggested in the press that the judge had made the decision to ‘weaken the prejudice’ against Fridays. 13 When, in 1901, New York State decided to execute the assassin of President McKinley on Monday 28 October, the Augusta Chronicle used the opportunity to request that the Georgia Superior Court Judges likewise cease Friday executions, in order to undermine the ‘superstition’ of Hangman’s Day. ‘The idea cannot be erased in a short time,’ it admitted, ‘but there is no reason why the good work should not be inaugurated at once.’ 14 Despite the clear concern over the influence of Hangman’s Day, there was no concerted federal attempt to reform the custom. The efforts were led, instead, by a group of concerned members of the public. It would be highly misleading to suggest that most suicide corpses in the early modern period were subject to such rites of desecration and post-mortem punishment. It was probably mostly applied in aggravated cases, such as murderers, or other criminals who committed suicide to avoid trial and state execution. There was, furthermore, growing medical and moral recognition of the relationship between mental illness and suicide, which led to the more compassionate treatment of suicide corpses when it was determined by the coroner, or other authority, that the act of self-murder was committed whilst insane. In 1742, the Augsburg government decreed that all suicides be given a consecrated burial, apart from those who were convicted criminals who killed themselves. The city executioners were not happy with this further loss of revenue. 38 In England, there was a long tradition, carried on into the nineteenth century, of burying suicides and unbaptised babies on the shaded north side of the churchyard. 39 Even if suicides were not buried in consecrated land, by the nineteenth century, it was increasingly standard across much of Europe for suicide corpses to be buried quietly and without ceremony close by or alongside churchyard walls, as in Abruzzo, Italy. The notion was quite widespread that the spirits of suicides, as with gibbeted criminals, manifested themselves in non-humanoid forms. In Valtellina, northern Italy, they appeared as big cats, whirlpools, and inanimate and animate shapes. Their wanderings did not stop until the day on which they should have died naturally. 45 In Normandy, France, the souls of suicides were thought to linger as a black dog, known as the varou. The same notion is known in England, too, with demonic saucer-eyed black dogs associated with the locations of violent deaths more generally. In 1851, it was reported that an old crossroads suicide burial near Boston, Lincolnshire, England, was haunted by a spirit, or ‘tut’, known as a shag foal. This was a variant of the black dog but in the form of a horse with saucer-like eyes. 46 The notion of the soul not being able to take on the form of its human vessel might reflect an echo of purgatorial punishment in popular eschatology. On passing from life to immortality, in the manner publicly described, I experienced those pangs which I have since learnt others have described. I have also heard the yells, groans, and shrieks, beyond the darkness; suffered the taunts and reproaches of my murdered victims; and am now dwelling in the atmosphere, around and near the scenes of my worldly existence; experiencing the bitter reproaches from the thoughts of those who are living … Oh horrible! Horrible! Wretched misery! And terrible but mysterious immortality! I must now leave you. My victims haunt me! There ran through the nineteenth-century spiritualist movement a strong vein of support for the abolition of capital punishment. 72 This was, in part, drawn from the influence of liberal, universalist and evangelical theologies that promoted redemption, universal salvation, passion and forgiveness. In spiritualist terms, execution did not act as a punishment, in the sense that it extinguished sentient life. Indeed, it prematurely transferred the dark souls of criminals to a more advanced state of being. In pragmatic terms, this also meant that the gallows, unnecessarily and perniciously, let loose a host of very bad spirits. Writing in 1856, Newton Crosland , husband of spiritualist writer and novelist, Camilla Dufour Crosland, stated, for instance, that ‘a believer in Spirit-manifestations cannot consistently approve of capital punishments’, for the wicked souls of executed murderers could wreak woe and destruction more fatally than their former bodies could perpetrate if they were still alive. 73 Writing in the 1890s, the Irish-born American Theosophist, William Q. Judge , explained that this was because the untimely dead were not fully deceased during their time in the astral plain known as kamaloka (a term borrowed from Buddhist belief). Ultimate death and spiritual release could only occur once their natural period of life had expired, ‘whether it be 1 month or 60 years’. It was these limbo-like astral shells, rather than the actual souls of the dead, with whom spiritualist mediums communicated, he believed. The experience of life in kamaloka depended on the moral status of the individual. ‘Executed criminals are in general thrown out of life full of hate and revenge, smarting under a penalty they do not admit the justice of,’ Judge affirmed. ‘They are ever rehearsing in kamaloka their crime, their trial, their execution, and their revenge.’ Therefore, when a medium provided these ‘spooks’ with an opportunity to communicate with those on earth, they injected into living persons ‘deplorable images of crimes committed and also the picture of the execution and all the accompanying cures and wishes for revenge’. And so in those countries that practised capital punishment, ‘crimes and new ideas of crimes are wilfully propagated every day’. 74 The dangers of communicating with the executed were revealed in the early days of modern spiritualism during the mid-nineteenth century. In November 1849, the body of a German peddler, named Nathan Adler , was found by a roadside about sixteen miles south of Auburn, New York. Albert Baham, one of three brothers involved in the crime, was sentenced to death, and cursed and railed at those whose evidence led to his execution. A spiritualist group employed a young female medium to use her clairvoyance to witness Baham’s execution, in order to ‘observe the separation of body and spirit, and the manifestation of the latter’. The experience was so profound that the medium fainted as Baham’s corpse fell through the trap, and from then on Baham’s spirit regularly communicated with her, she said. He cursed his enemies, vowing revenge upon them and threatening to cause the deaths of several Auburn residents who had crossed him. As time went on, Baham’s spirit began to take physical control of the medium, causing her to beat her arms against her chair until they were black and blue. Then she began to experience the sensation of a rope being drawn around her neck, while Baham said he wished to strangle her to death. Physicians were consulted to sooth her bodily torment, and magnetisers attempted to rid her of the malignant spiritual influence. All to no avail. She was finally rid of Baham’s possession by another medium, who called upon the aid of St. Paul. 75 The cautious spiritualist, Eliab Capron , who knew the medium concerned, first printed an account of the case in 1855, observing the dangers of communicating with ‘coarse and undeveloped’ characters such as Baham. Mariano Cipriani, ‘Contributo allo studio dei vecchi appellati-vi agiografici del Mal Caduco’, Rivista di storia della medicina X, 1, (1966) 96; Adriano Puce, ‘Il male di S. Donato nel Salento. Contributo psicologico-sociale’, La Ricerca Folklorica 17, (1988) 43–59. For example, Roud, Penguin Guide to the Superstitions of Britain and Ireland, pp. 197, 217. John E. Ferling, Setting the World Ablaze: Washington, Adams, Jefferson, and the American Revolution (Oxford, 2000), p. 160. Newman Ivey White and Wayland D. Hand (ed. ), The Frank C. Brown Collection of North Carolina Folklore (Durham, NC, 1964), pp. 197–199. N.C. Hoke, ‘Folk-Custom and Folk-Belief in North Carolina’, Journal of American Folklore 5 (1892) 113. Melba Porter Hay (ed. ), The Papers of Henry Clay: Supplement, 1793–1852 (Lexington, 1992), p. 281. The Horticulturist, and Journal of Rural Art and Rural Taste 3 (1849) 233. Corey Retter, 1861–1865 Union Executions ( ), p. 169. Gordon C. Roadarmel, ‘Some California Dates of 1861’, California Historical Society Quarterly 39 (1960) 295. Annals of Cleveland 1818–1935 (Cleveland, 1937), p. 49. Sullivan Democrat, 16 May 1867. Augusta Chronicle reprinted in the Thomasville Daily Times Enterprise, 1 October 1901; Riverside Louis P. Masur, Rites of Execution: Capital Punishment and the Transformation of American Culture, 1776–1865 (Oxford, 1989), p. 97. Wellsville Allegany County Reporter, 18 December 1889. Augusta Chronicle reprinted in the Thomasville Daily Times Enterprise, 1 October 1901. Thirteenth Annual Report of the Officers of the Thirteen Club (1895), p. 21. Clifford R. Caldwell and Ron DeLord, Eternity at the End of a Rope: Executions, Lynchings and Vigilante Justice in Texas 1819–1923 (Santa Fe, 2015), passim; Fort Wayne Sentinel, 19 April 1905; Capital Punishment: Hearings Before the Committee on the Judiciary, United States Senate, Ninety-seventh Congress, First Session (Washington, 1981), pp. 422, 573. Guy Beiner, Remembering the Year of the French: Irish Folk History and Social Memory (Madison, 2007), pp. 217, 230. L. Winstanley and H.J. Rose, ‘Scraps of Welsh Folklore, I. Cardiganshire; Pembrokeshire’, Folklore 37 (1926) 159. On urban development and the transience of ghost narratives see Karl Bell, ‘Civic Spirits? Ghost Lore and Civic Narratives in Nineteenth-Century Portsmouth’, Cultural and Social History 18 (2014) 51–68. The Examiner, 29 October 1845. Sheffield and Rotherham Independent, 4 February 1868. Dundee Courier, 27 March 1875. Wheeling Register, 4 March 1888. Derry Journal, 22 April 1908. Charles Mackie, Norfolk Annals: A Chronological Record of Remarkable Events in the Nineteenth Century (Norwich, 1901), Vol. 1, entry 27th July 1807. Thanks to Elizabeth Hurren for this reference. St. James’s Gazette, 15 January 1883. London Evening Post, 11 November 1749. On ghost hoaxers, see Davies, The Haunted. New York World, 16 September 1894. Brett Cogburn, Rooster: The Life and Times of the Real Rooster Cogburn (New York, 2012), pp. 92–93. Harrisburg Saline County Register, 8 September 1899. Sedalia Weekly Sentinel, 17 July 1903. Beiner, Remembering the Year, p. 217. Kathy Stuart, ‘Suicide by Proxy: The Unintended Consequences of Public Executions in Eighteenth-Century Germany’, Central European History 41 (2008), 413–445; Tyge Krogh, A Lutheran Plague: Murdering to Die in the Eighteenth Century (Leiden, 2012). See, for example, Kirsi Kanerva, ‘Having no Power to Return? Suicide and Posthumous Restlessness in Medieval Iceland’, Thanatos 4, 1 (2015) 62–63; Nancy Caciola, ‘Wraiths, Revenants, and Ritual in Medieval Culture’, Past and Present 152 (1996) 3–45; Monballyu, Six Centuries of Criminal Law, pp. 231–234. Riikka Miettinen and Evelyne Luef, ‘Fear and Loathing? Suicide and the treatment of the corpse in early modern Austria and Sweden’, Frühneuzeit-Info 23 (2012), 102; Stuart, Defiled Trades, p. 197. Michael MacDonald and Terence R Murphy, Sleepless Souls: Suicide in Early Modern England (Oxford, 1990), pp. 44–49; Tarlow, Ritual, Belief and the Dead, pp. 147–149; Michael MacDonald, ‘The Secularization of Suicide in England 1660–1800’, Past & Present 111 (1986) 50–100. Portsmouth Evening News, 14 December 1899; Davies, The Haunted, p. 52. David Lederer, ‘Living with the Dead: Ghosts in Early Modern Bavaria’, in Kathryn A. Edwards (ed. ), Werewolves, Witches, and Wandering Spirits. Traditional Belief & Folklore in Early Modern Europe (Kirksville, 2002), p. 37, fn. 46. Stuart, Defiled Trades, p. 198. Steve Roud, The Penguin Guide to the Superstitions of Britain and Ireland (London, 2003), pp. 91–92. Milton Núñez, ‘Remedies against Revenance: Two Cases from Old Hailuoto (Karlö), North Ostrobothnia, Finland’, Thanatos 4, 2 (2015) 80; Alexander Kästner and Evelyne Luef, ‘The Ill-Treated Body: Punishing and Utilizing the Early Modern Suicide Corpse’, in Ward (ed. ), A Global History of Execution and the Criminal Corpse, pp. 147–169. See also, Nicola Whyte, ‘The deviant dead in the Norfolk landscape’, Landscapes 4 (2003) 24–39. Robert Halliday, ‘The Roadside Burial of Suicides: An East Anglian Study’, Folklore 121 (2010) 81–93; Halliday, ‘Wayside graves and crossroad burials’, Norfolk Archaeology 42 (1994) 80–83; Halliday, ‘Wayside graves and crossroad burials’ Proceedings of the Cambridge Antiquarian Society 84 (1995) 113–119. ‘Criminal Responsibility and Punishment for Suicide’, Central Law Journal 55 (1902) 361. For examples of night burials, see: The Huddersfield Chronicle and West Yorkshire Advertiser, 19 November 1853; Reynolds’s Newspaper, 19 May 1861; The Bury and Norwich Post, and Suffolk Herald, 23 December 1862; Reynolds’s Newspaper, 14 January 1872; Western Mail, 16 February 1877; Nottinghamshire Guardian, 1 June 1889. Lancashire Daily Post, 27 August 1906; Lancashire Evening Post, 16 January 1902. Paul Hugger, ‘Die Beerdigung der Selbstmörder im Kanton St. Gallen’, Schweizerisches Archiv für Volkskunde 51 (1961), 41–48. Milani, Streghe, p. 351; Gennaro Finnamore, Tradizioni popolari abruzzesi (Torino-Palermo, 1894), pp. 102–103. G.J.C. Bois, Jersey Folklore & Superstitions (Milton Keynes, 2010), Vol. 1, pp. 16–17; Notes & Queries 99 (1851) 212. More generally, see Mark Norman, Black Dog Folklore (London, 2016). See, for example, Paul Barber, Vampires, Burial and Death: Folklore and Reality (New Haven, 1988); David Keyworth, Troublesome Corpses: Vampires and Revenants (Southend-on-Sea, 2007); L’upcho S. Risteski, ‘Categories of the “Evil Dead” in Macedonian Folk Religion’, in Gábor Klanickzay and Éva Pócs (eds), Christian Demonology and Popular Mythology (Budapest, 2006), pp. 204–207. Susan K. Morrissey, Suicide and the Body Politic in Imperial Russia (Cambridge, 2006), pp. 232–233. David Lederer, ‘The Dishonorable Dead: Elite and Popular Perceptions of Suicide in Early Modern Germany’, in Sibylle Backmann, Hans-Jörg Künast, B. Ann Tlusty & Sabine Ullmann (eds), Ehrekonzepte in der Frühen Neuzeit. Identität und Abgrenzungen (Augsburg, 1998), 349–365; Evelyne Luef, ‘Punishment Post Mortem—The Crime of Suicide in Early Modern Austria and Sweden’, in Albrecht Classen and Connie Scarborough (eds), Crime and Punishment in the Middle Ages and Early Modern Age (Berlin, 2012), p. 570. Paul Hugger, ‘Die Beerdigung der Selbstmörder im Kanton St. Gallen’, Schweizerisches Archiv für Volkskunde 51 (1961) 41–48. For general ideas about the German tradition of suicide burials, see also: Paul Geiger, ‘Die Behandlung Der Selbstmörder im deutschen Brauch’, Schweizer Volkskunde 26 (1925–1926) 145–160. Thomas A. Kselman, Death and the Afterlife in Modern France (Princeton, 1993), pp. 104–105. Morrissey, Suicide and the Body Politic, p. 233. Giuseppe Nicasi, ‘Le credenze religiose delle popolazioni rurali dell’alta valle del Tevere’, Lares 1 (1912) 167–169; Pietrina Moretti, ‘Ora feriada e ora mala’, Lares 21 (1955) 61–64; Alfonso Maria Di Nola, La Nera Signora: antropologia della morte ( Rome, 1995), p. 128; Giovanni Tassoni, Arti e tradizioni popolari. Le inchieste napoleoniche sui costumi e le tradizioni nel regno italic (Bellinzona, 1973), pp. 134, 147. Marisa Milani, Streghe, morti ed esseri fantastici nel Veneto (Padova, 1994), pp. 350–351. Giovanni Bronzini, Tradizioni popolari in Lucania (Matera, 1953), pp. 243–244. Maria Pia Di Bella, ‘Pietà e Giustizia. La “santificazione” dei criminali giustiziati’, La Ricerca Folklorica 29 (1994) 69–72; Maria Pia Di Bella, ‘Conversion and Marginality in Southern Italy’, in Andrew Buckster and Stephen D. Glazier (eds), The Anthropology of Religious Conversion (Lanham, 2003), pp. 85–87. Michael P. Carroll, Veiled Threats: The Logic of Popular Catholicism in Italy (Baltimore, 1996), pp. 148–151. See also, Adriano Prosperi, ‘Il sangue e l’anima: ricerche sulle compagnie di giustizia in Italia’, Quaderni storici 17 (1982) 959–999. E. Sidney Hartland, ‘The Cult of Executed Criminals at Palermo’, Folklore 21 (1910) 168–179; Maria Tedeschi, ‘Canti di devozione alle Anime del Purgatorio e dei Corpi decollati’, Archivio per lo studio delle tradizioni popolari 16 (1937); Giuseppe Pitrè, Usi e costumi credenze e pregiudizi del popolo siciliano (Palermo, 1978) Vol. 4, pp. 8–11. Giuseppe Pitrè, Biblioteca delle tradizioni popolari 24 (1913), 185–186; Binde, Bodies of Vital Matter, p. 125. Giuseppe Pitrè, Biblioteca, Vol. 24, 189–190; Sebastiano Salomone, Storia di Augusta (Siracusa, 1905), p. 295. Giuseppe Pitrè, Biblioteca, Vol. 24, p. 187. Cited in Carroll, Veiled Threats, p. 156. Binde, Bodies of Vital Matter, p. 127. Tausiet, Urban Magic, p. 149. Emma Hardinge, Modern American Spiritualism (New York, 1870), p. 285. J.G.H. Brown, A Message from the World of Spirits (London, 1857). See Logie Barrow, Independent Spirits: Spiritualism and English Plebeians, 1850–1910 (London, 1986), Ch. 3. See Georgina Byrne, Modern Spiritualism and the Church of England, 1850–1939 (Woodbridge, 2010), pp. 90–91. Francis H. Smith, My Experience: Or, Foot-Prints of a Presbyterian to Spiritualism (Baltimore, 1860), pp. 132–133. Christine Ferguson, Determined Spirits: Eugenics, Heredity and Racial Regeneration in Anglo-American Spiritualist Writing, 1848–1930 (Edinburgh, 2012), pp. 154–156; James Gregory, Victorians against the Gallows: Capital Punishment and the Abolitionist Movement in Nineteenth Century Britain (London, 2012), Ch. 4. Newton Crosland, Apparitions; A New Theory (London, 1856), p. 20. See also, ‘The Literature of Spirit-Rapping’, The National Review 4 (1857) 142. William Q. Judge, The Ocean of Theosophy (New York,  1910), pp. 108, 48. Eliab Wilkinson Capron, Modern Spiritualism: Its Facts and Fanaticisms (Boston, 1855), pp. 114–117. For details of the Adler murder, see: https://privatelettersjsg.wordpress.com/2014/06/27/1849-murder-of-nathan-adler/; Particulars of the murder of Nathan Adler on night of November sixth, 1849 (New York, 1850). William R. Gordon, A Three-Fold Test of Modern Spiritualism (New York, 1856), pp. 40–42. The Medium and Daybreak, 24 July 1885, 466. See also, the Gerald Massey archive site http://gerald-massey.org.uk/massey/cbiog_part_06.htm. Brown, Message from the World of Spirits, p. 34.